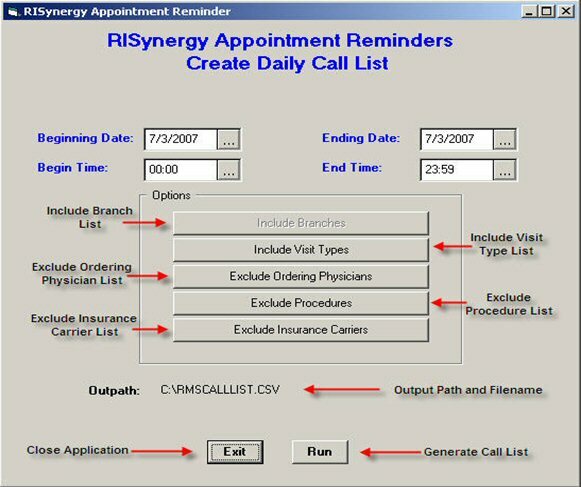 The RISynergy® Appointment Reminder is an add-on module that can be purchased to work with the RISynergy system. This module was created by partnering with JulySoft’s ReminderPro Patient Messaging System. It is a simple, yet effective appointment confirmation system. Routine phone calls can overload office staff and take valuable time away from patient care in the facility. This system will take care of the task for you. Helps Prevent Appointment No-Shows – Appointment Reminder calls patients with friendly appointment reminders (in English or Spanish). Provides Consistent Communication – Appointment Reminder keeps track of calls that are busy or unanswered and the system won’t forget to call back later. It can call after hours when people are more likely to be at home. Reporting – Provides detailed reports that give you a valuable audit trail of patient contact. Eases Staff Overload – Appointment Reminder works nights and weekends and is more timely and cost effective than postcards. Provides a Premiere Solution – Appointment Reminder maintains a very large library of prerecorded names and automatically combines multiple calls to the same household.